Product #21303 | SKU 508945 | 0.0 (no ratings yet) Thanks for your rating! Sigma's 70-300mm f4-5.6 APO DG Macro is one of several telae zoom lenses. It is a compact Apochromatic telae zoom lens incorporating two Special Low Dispersion glass elements in the front lens group, plus one Special Low Dispersion glass element in the rear lens group, to minimise chromatic aberration. 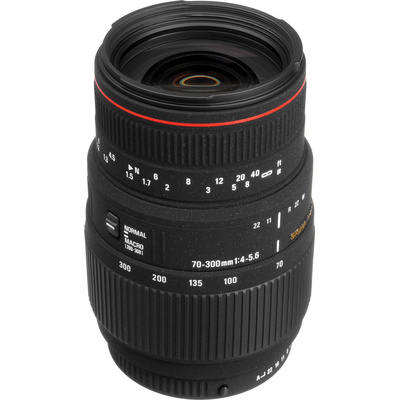 This Telae-Macro Zoom lens is capable of focusing down to 1:2 (half life-size) reproduction ratio at 300mm focal length. It also has a switch for changeover to macro photography at focal lengths between 200mm and 300mm. The lens materials used in this product are lead and arsenic free ecological glass. The improved DG lens design corrects for various aberrations. This lens is specially coated to get the best colour balance whilst cutting down on ghosting caused by reflections from the digital image sensor.